I borrowed Philip Hoare's Risingtidefallingstar from the library purely on the recommendation of The Reluctant Dragon, because Susan and I seem to share similar tastes! This is one of those books that is difficult to classify. It's part memoir, part nature study, part philosophical musing, part biography, all twining around the subject of the ocean. Hoare recounts the personal histories of various figures (Herman Melville, Elizabeth Barrett Browning, Stephen Tennant, Wilfrid Owen and others) whose lives were shaped by the sea in different ways, finding unexpected echoes and resonances between them, across time and space. But this is also a very personal story about Hoare himself and his own obsession with the ocean (he has written two previous books about the sea). It's also a love letter to David Bowie in The Man Who Fell to Earth (though neither the film nor the performer is named). 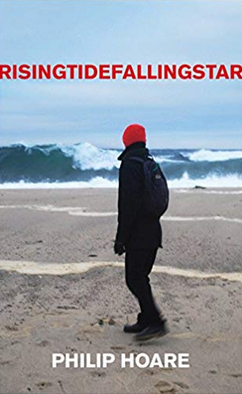 Risingtidefallingstar is a meditative book which kept surprising me, like a wave rising up underneath you. The best way to approach it is just to spread your arms, lie back and surrender, and let it drift you where it will. Yes, you are quite right - with these odd, unclassifiable books, lying back and drifting seems the only approach. I've also read a couple of books by W G Sebald (Austerlitz, Rings of Saturn) where my desire to work out what he was on about got in the way, and once I surrendered, they were among my peak reading experiences. And yet in general I'd say I don't really enjoy "challenging" books all that much. And speaking of challenges - we're about to start Book Group again. I wonder what the CAE have in store for us in 2019! And thank you for following up my recommendation. Yes, we do seem to have similar tastes! I might have to check out WG Sebald -- maybe not just yet, though. One unclassifiable book at a time is enough. Even when you just float through them, they are quite hard work!